Sandi came to AAE on January 7, 2018, after her owner was experiencing a family health and financial crisis. 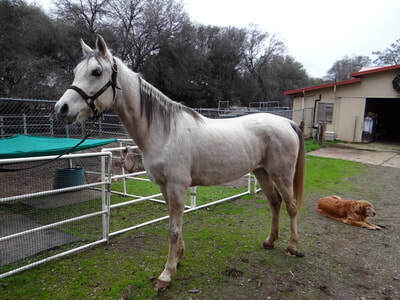 Sandi is a 5 year old Arabian mare. We picked her up from her boarding facility in the midst of winter weather. The facility owner said she had been moved to the roundpen because she ran right through electric fencing, "very hot" electric fencing. 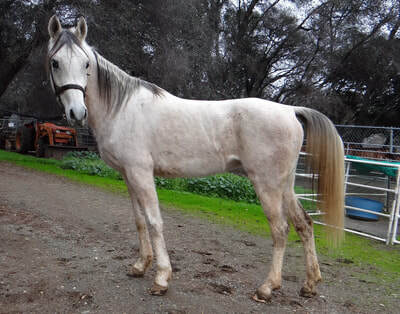 Sadly, we found a very cute, but skinny lil' mare enduring the elements with no shelter, no wind break, and no food. We can't help but wonder if she was in the roundpen because her owner was months behind in rent, or maybe she braved the "hot" fence because she was cold and needed food. Sandi loaded quietly, but she didn't travel well. She danced in the trailer the entire ride to AAE. Once at AAE, she had a difficult time settling into a paddock alone. With a little time and some rearranging, she calmed and focused on food. She's making steady progress and is looking great. Thankfully, her vet check went well fairly well. 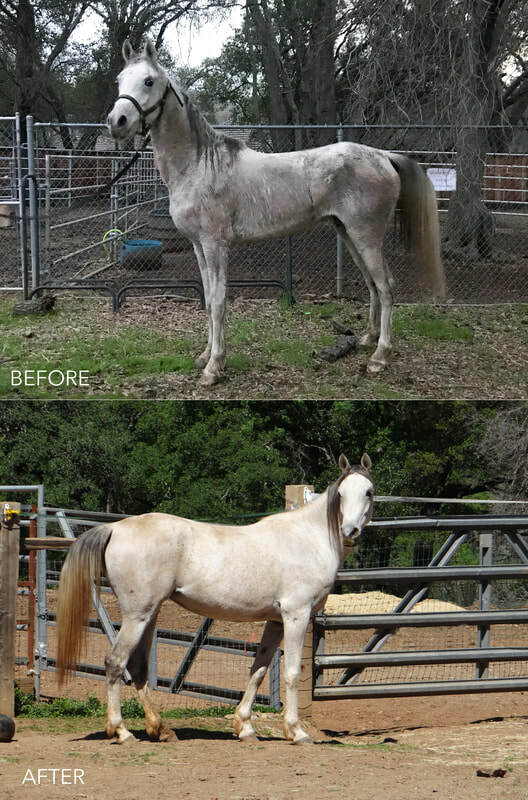 Besides her lack of weight, she has a few melanomas under/around her tail, not uncommon for white (gray) horses. Fortunately, none are creating any issues that require removal. 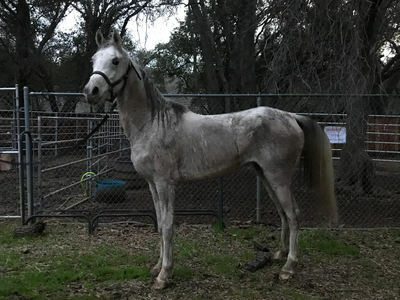 She was a bit naughty for the farrier; she needs some extra work with handling her hind hooves, and she needs a bit of confidence. She tends to rely on another horse for confidence and gets very stressed and reactive when no other horse is around. We'll work on building her confidence before we ask much more of her. 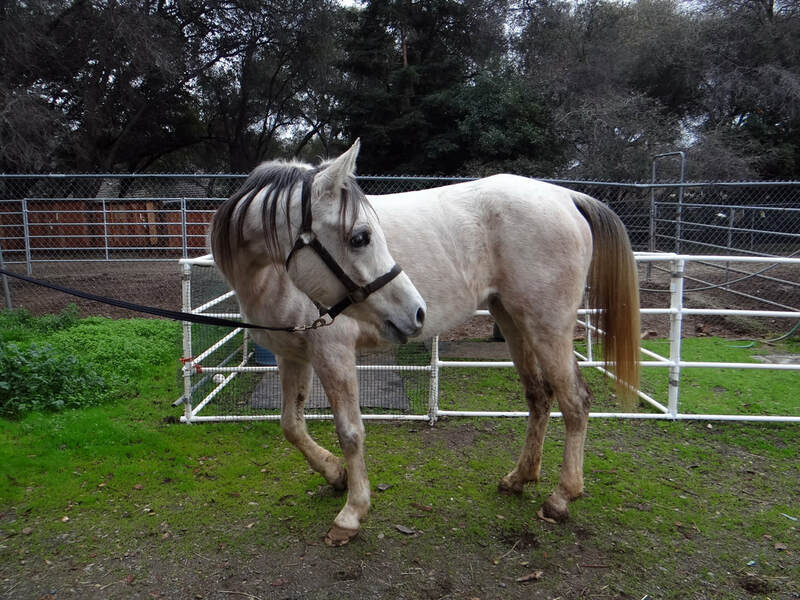 We were told Sandi has been ridden in the past, and she was described as "green, very green". 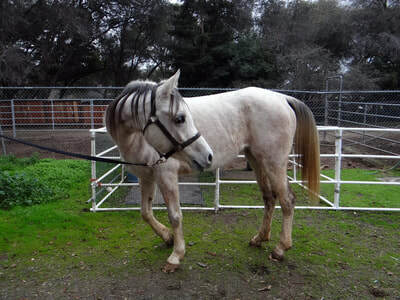 Sandi is up to date with vaccines, deworming, and hoof and dental care.